Both organic and non-organic mulches will protect the soil from the hot summer sun effectively preventing evaporation and allowing better water retention. If you live in a warm and dry climate, this can help you save water when it matters the most. Due to oils that serve as a natural insect repellent, different types of mulches have the ability to ward off certain pests. By trapping moisture, mulch will prevent rainwater from washing away your soil. The protective layer of mulch can prove to be invaluable at saving the integrity and structure of your garden. 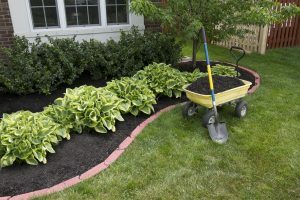 A nice layer of mulch will work to control unwanted weeds because sunlight will not be able to reach the soil where the weeds will be sprouting from so they will never have a chance to grow. Mulching provides many benefits to your garden, not to mention it looks great! This summer, make sure your garden is protected. It really is just that easy.